I’ve just started exploring Excel 2016. As one of the tentpole applications for the newOffice 2016, it has a raft of new features for lucky upgraders. Take a closer look with me and see what you think. 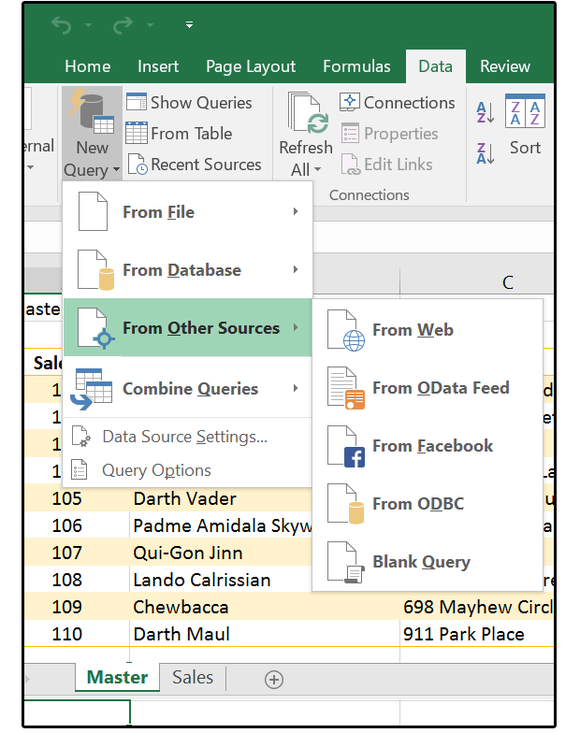 The database enhancements alone—which include merging some of the previous Add-On programs such as Power Pivot and Power Query—more than justify the upgrade. 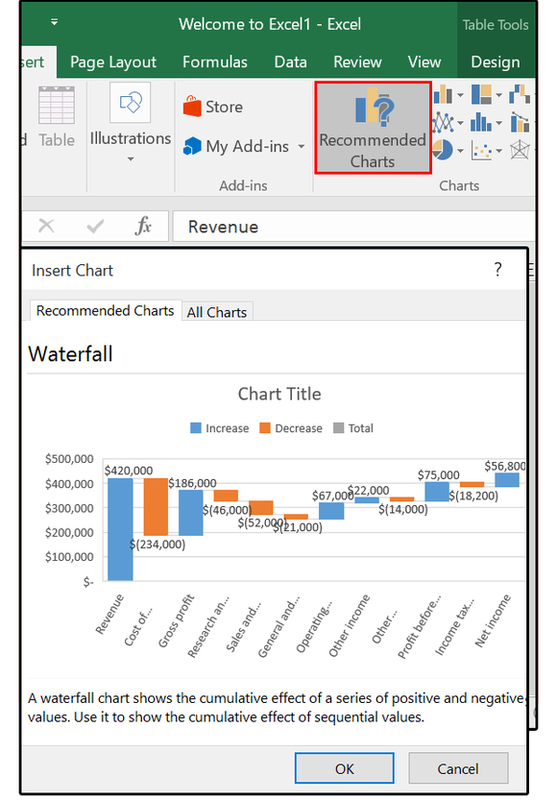 You’ll find options for Power Queries; Data Models; Reports; Pivot Tables; One-Click Forecasting; and some new, one-button workbook sharing through Power BI for creating and using interactive reports and dashboards. Quick analysis tools are a real timesaver, nudging you in the right direction with your data. After you’ve completed your spreadsheet or table, select the entire range. Note the lightning worksheet icon at the bottom right corner of the range: Click this icon, and a popup menu appears that displays a half-dozen options for what to do with this data. Note that each icon is a button/link to a submenu that provides more options (the selected icon turns dark green and bold). 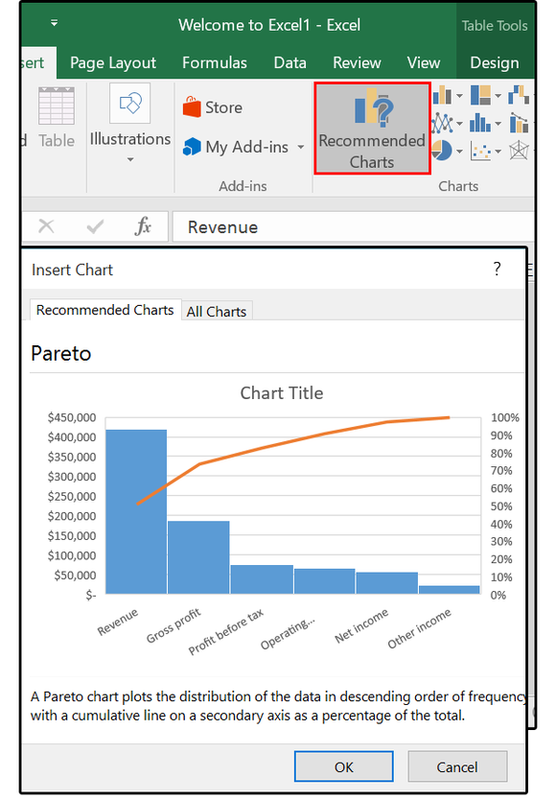 Excel has six new charts to show off to your clients and colleagues. It’s still an easy process to create them, too: Just highlight the database table, select Insert >Recommended Charts, then choose one from the pictured samples. Or, if you’re not inclined to use one of the recommendations, click the All Charts tab, choose a category from the list, then select one of the designs from the pictured charts in that category. Pareto sorts the bars by highest first and shows which bars have the biggest impact or highest return. Use this chart data to decide where to assign your resources. Waterfall (aka ‘flying brick’ chart) provides a visual method for viewing a series of positive and negative data, such as monthly cash flows. Because the bars seem to hover between the start and end columns, it looks sort of like a waterfall, hence the name. 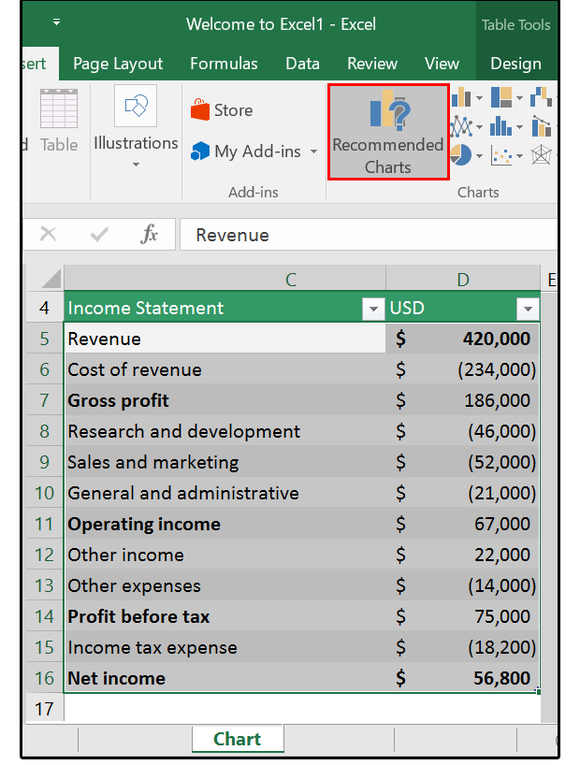 Excel’s new templates come with sample data and charts, plus hands-on exercises that teach you how to use each template. 08 New template Cashflow—click the Let’s Get Started button. 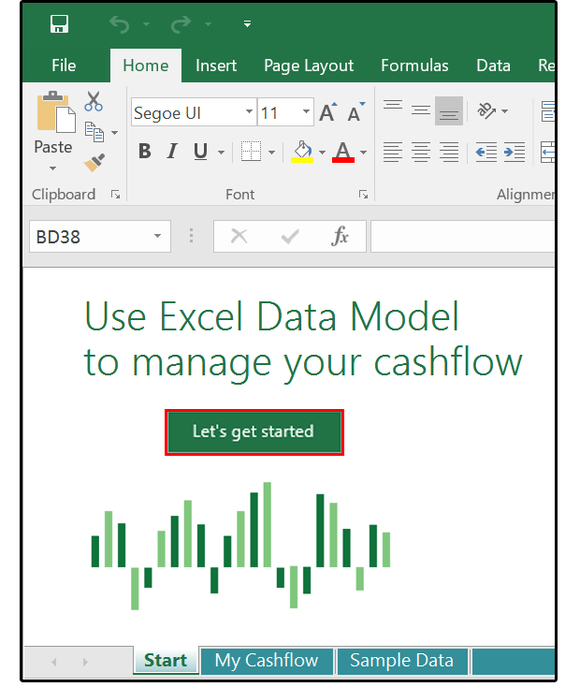 For example, in the My Cashflow template, Excel encourages you to try the Excel Data Model to manage your cash flow. 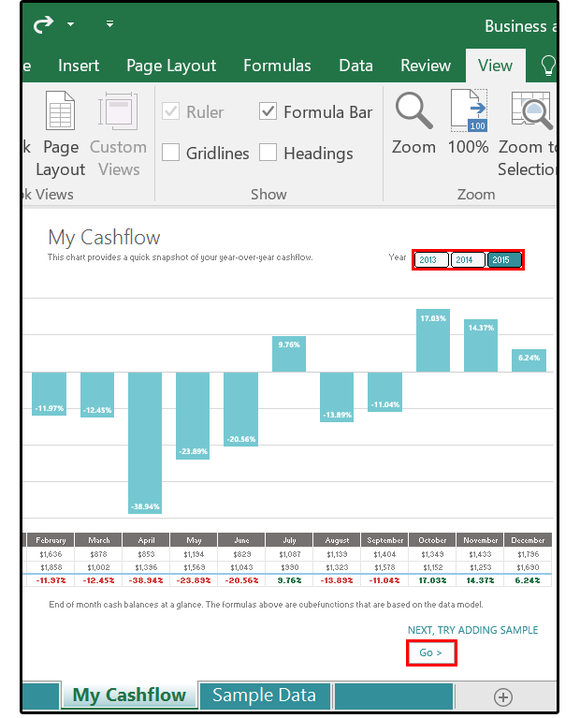 Click the Let’s Get Started button, and Excel displays the My Cashflow charts. Click the buttons 2013, 2014, or 2015 to see the chart data change by year. If you click the Go button, you can add some new data to the Sample Data spreadsheet, then watch the charts change based on your new input. 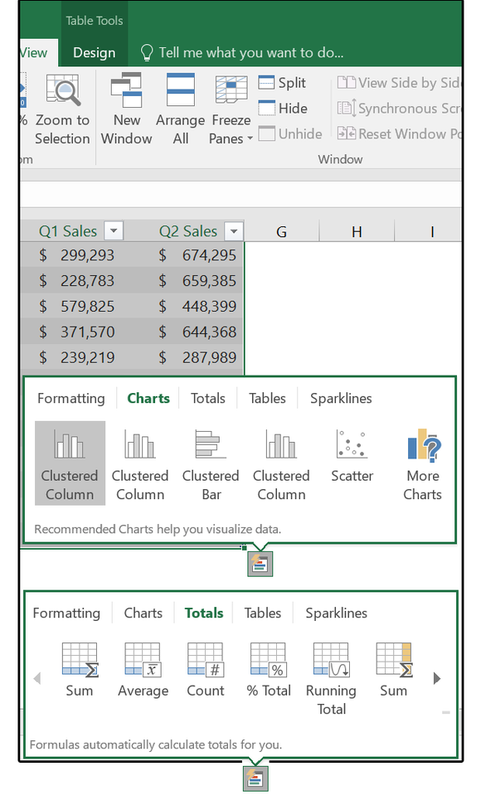 Once you get the hang of it, just replace Excel’s sample data with some real data of your own and Excel does the rest. Other new templates include Stock Analysis and My Calendar. These mapping tools were an add-in program in previous versions, but they’re now included in 2016. You can compare data such as temperatures, or rainfall, or populations of a given area over a specified time, rendered in three-dimensional images. 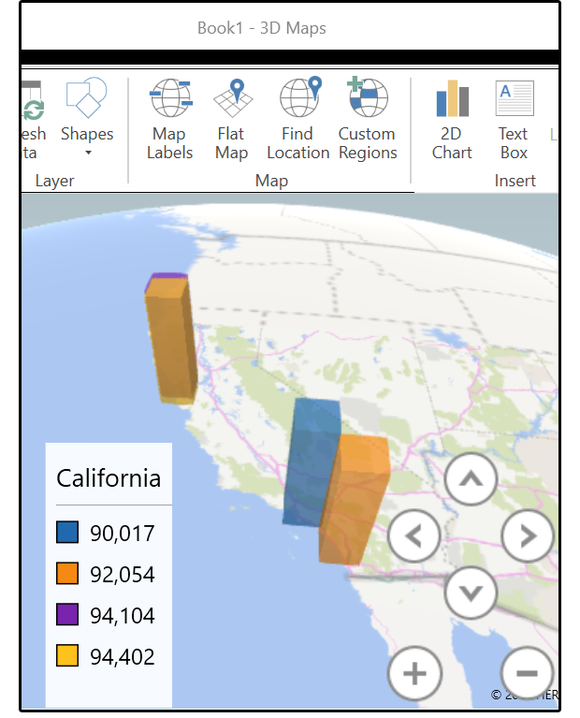 You can map data (plot millions of rows of information visually on Bing maps), discover how data changes over time and space, and create and share stories (called Video Tours) about the information you’ve collected. 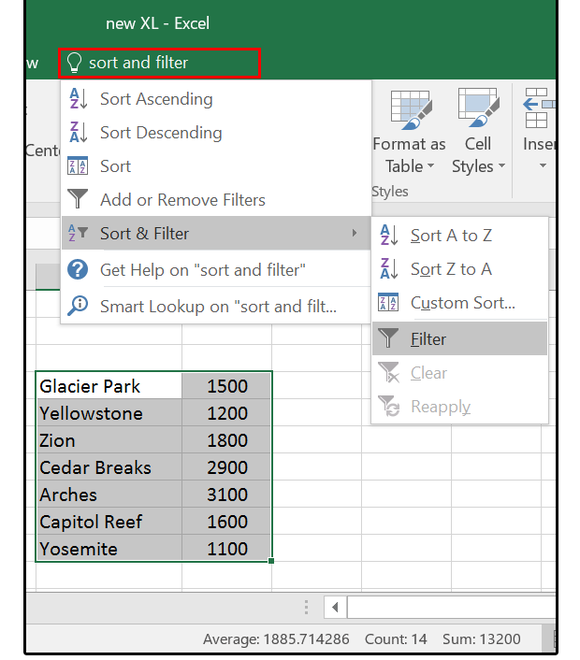 Stay tuned for a complete review on this excellent new feature in Excel 2016. Real-time collaboration is finally here. Share ideas, data, queries, reports; and co-author worksheets, charts, graphs, Pivot Tables, databases, and more. Click the Share button in the top right corner. When the Share panel opens, click theSave to Cloud button. The Backstage menu opens and displays the Save As screen. Choose the option that fits your situation—OneDrive, SharePoint, or another online location. Select the appropriate folder and click the Save button. Once saved, the document reappears with the Share panel open. In the Invite People field, click the open book icon and select colleagues from your address book in Outlook. 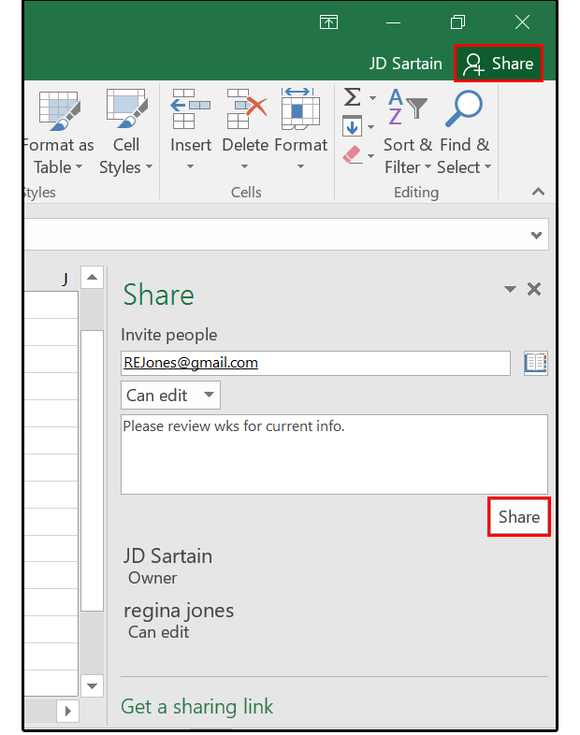 Set permissions and notifications, then click the Share button to send the document links to your designated colleagues. This feature (available in most of the Office 2016 programs) is like having the Internet on speed dial. Also called “Insights” from Bing, the information hails from various resources such as Wikipedia, the Oxford dictionary, Bing image search, and Bing Snapshot. Just place your cursor on any word or highlight any phrase on your spreadsheet and right-click. Select Smart Lookup from the dropdown list. The “Insights” panel opens on the right and displays information and images about the subject you highlighted. Located on the right side of the Ribbon menu after the last tab, this feature provides a search box with a light bulb that says “Tell me what you want to do.” It’s like your personal valet: Ask it a question, command it to do something, or select one of the Recently Used queries, and it obeys. Just click the Tell Me box and type your question. A list box drops down with your current request on top; followed by alternate choices (if there are any); followed by the most Recently Used queries; followed by an option to select and use the official Help menus; followed by the Smart Lookup feature, which adds the knowledge of the Internet to help you find the right answer. 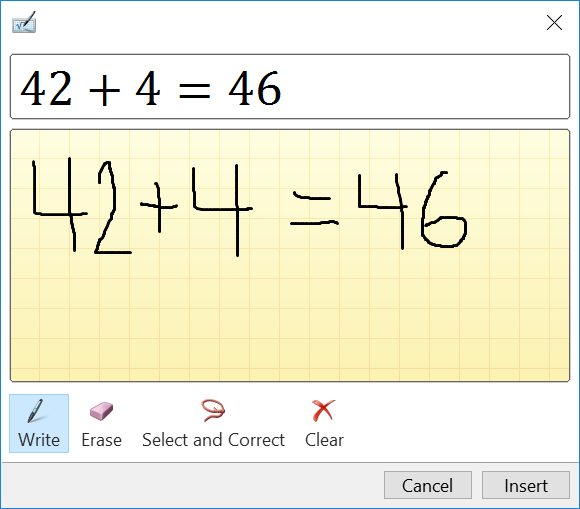 This new feature converts your handwritten equations (or mathematical problems) to text, so you can insert them into your documents. You can use whatever tool works best for you—the mouse, a digital or light pen, or even your fingers—to write the math equations/problems. 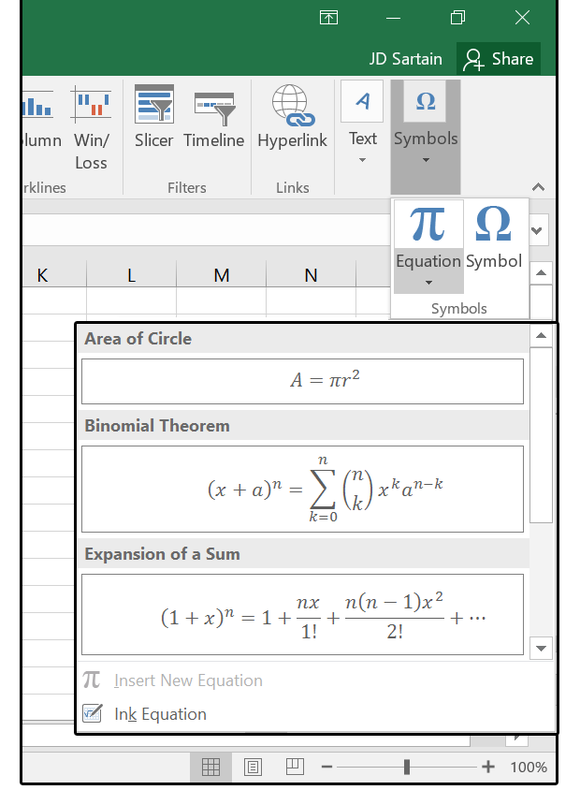 Just select Insert > Symbols > Equation, then click Ink Equation from the drop-down menu. A Preview chalkboard box appears with writing tools displayed along the bottom. 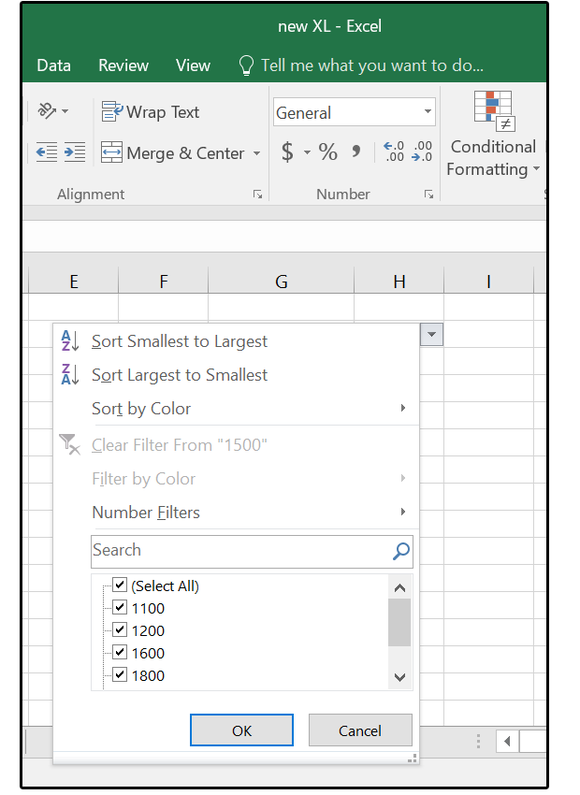 That’s all for the big stuff, and Excel has a lot more surprises for its fans. 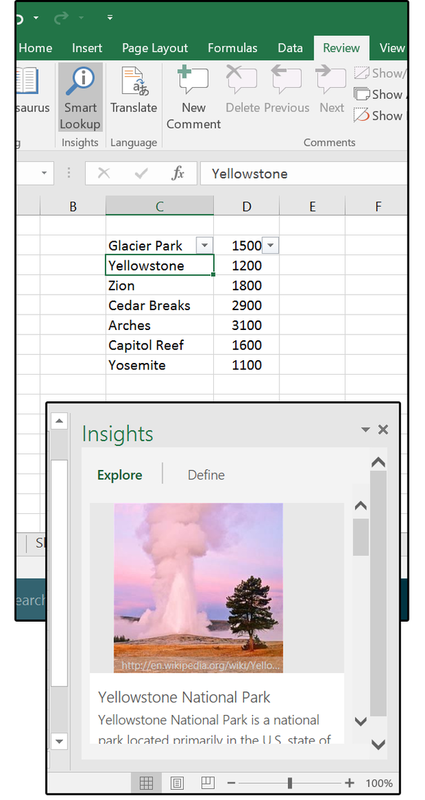 Stay tuned for deeper dives into more of the great features in Excel 2016.